Hillside Cottage Units- limited view. Newly renovated. Queen with bath or Queen and Twin bed with bath. Refrigerator/microwave. 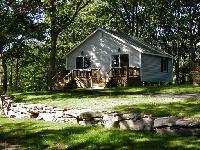 View of front of a Hillside Cottage with deck and separate entrances. View of all three Hillside Cottages. 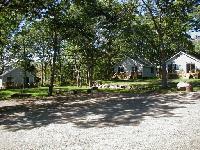 Two Units per cottage.